This paper addresses the necessary procedures that need to be considered when designing an optical sub-system of low concentrator photovoltaic (LCPV) module. CPV systems make use of optical elements and solar tracking to concentrate solar flux onto a photovoltaic (PV) receiver. The performance of a concentrator module is highly dependent on the configuration and alignment of the optical elements in the system. In this study, various design considerations were taken into account to construct a LCPV module that was characterised with respect to optical design and electrical performance. With the growing interest and planned large-scale deployment of photovoltaics (PV) in South Africa, Concentrator Photovoltaics (CPV) is one of the technologies that has attracted a renewed interest for electricity production. CPV modules are a cost effective alternative to flat-plate photovoltaic (PV) modules since they concentrate sunlight onto small efficient solar cells (Luque & Hegedus, 2003). The general concept of CPV is to replace expensive solar cell material with inexpensive optical elements such as mirrors and lenses, thereby reducing the cost of electricity being generated from solar energy. This can only be done by successfully integrating and optimizing the optical, electrical and thermal subsystems of a CPV system. In low concentration photovoltaics (LCPV) modules, solar cells are subjected to higher irradiance levels than the cells in flat plate PV modules. The electrical output, and hence efficiency of a LCPV module is dependent on the amount of irradiance, temperature and more importantly the uniformity of illumination across the solar cells. Three subsystems can be identified that determine a successful CPV module design, namely optical, thermal and electrical. This paper discusses the design aspects and characterisation of the optical subsystem of a LCPV concentrator. 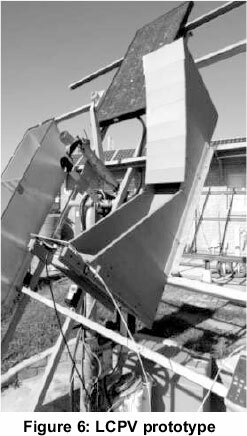 Previous research at the Nelson Mandela Metropolitan University (NMMU) resulted in the construction of a V-trough concentrator reaching 2.4 X concentration (geometric concentration XG = 3) (Butler et al., 2010). This study highlighted several design shortcomings, the main shortcoming being the excessive physical height of the module reflectors due to the direct correlation between the vertical height and the geometric concentration of the module. A new concentrator module design had to be implemented to enable higher concentration levels and practical module geometry. The current study is a continuation of the previous research, with the aim of improving the concentrator module design. This paper addresses the optical modelling, design and development of a suitable LCPV module. Various design aspects and reflector materials were considered to demonstrate the feasibility of the concept. The initial design, reported here, made use of a vertical PV receiver that employs standard multi crystalline silicon solar cells and a faceted reflector that has a low aspect ratio. An experimental prototype was constructed and characterised with respect to the optical concentration ratio and illumination uniformity. The electrical performance was also briefly addressed in order to facilitate an optimum design for the LCPV system. This work has shown the importance of careful optical design, with results from the initial optical design to be incorporated into a more robust and optically efficient design. The initial LCPV system design was based on the requirement that the aspect ratio of a module, ratio of module height to width, must be low and the concentration ratio must be of the order of 5X. In addition, the design implemented, used a faceted parabolic reflector as concentrator element and had to satisfy a certain set of boundary conditions as listed below and illustrated in Figure 1.
i) Module profile must be as flat as possible - low aspect ratio. (Ratio of height to overall width, to be as low as practically possible). ii) Optical reflective concentrator element - consisting of rectangular reflective facets. iii) PV receiver (PV laminate) must be parallel to incident light from sun. iv) Bottom of the receiver must be in line with the top of the reflector. v) Beams incident on opposite ends of a facet to be reflected to the opposite ends of the receiver. A suitable mathematical model was developed to design and evaluate various arrangements for the optical elements for LCPV application. 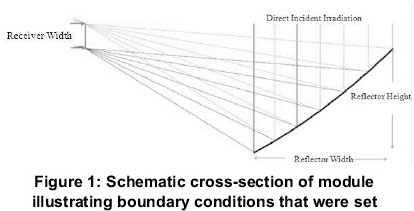 This model was based on using a facetted reflector element that needs to be arranged to meet the set of boundary conditions discussed already discussed. Model input parameters include; total reflector width; receiver width and active area of receiver; receiver angle ( 0° in this case, i.e. parallel to incoming solar irradiance). The model returns a full optical design of the concentrator i.e. geometric orientation of facets and PV laminate, as well as an initial calculation of theoretical geometric concentration ratio and dimensions of configuration. It is important that the optical elements create a uniform illumination profile across the PV cells as any illumination non-uniformity will result in mismatch effects and generate temperature gradients which will affect the power output of the solar receiver (Luque & Andreev, 2007)..
Output from the model, traced in Optica 3 (Wolfram), is shown in Figure 2. 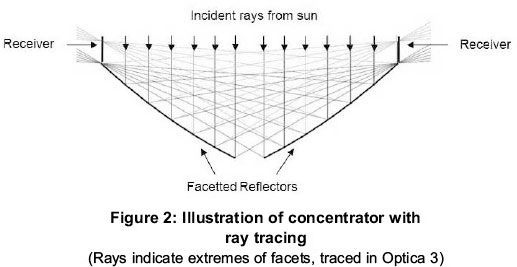 The rays that are displayed in Figure 1 and 2 are the rays incident on the extremes of each facet thus indicating that the top of the facet reflects rays towards the top of the PV receiver, and the rays incident on the bottom of the reflector are reflected to the bottom of the PV receiver. The model developed was used to confirm the physical design parameters to be used in the initial LCPV prototype. This included investigation of number of facets, receiver width and physical dimensions of the LCPV module. Various reflector materials, including polished Aluminium cladding, Alanod Standard Miro and Alanod Miro Sun (Alanod Solar) reflective sheets, were considered for use in the prototype. The reflective materials were characterised with respect to spectral reflectance. Verification of illumination intensity and uniformity on the receiver plane was done by taking a photograph of the illuminated area and analysing it with a software package named Image J (Image J). Electrical output parameters were measured at 1 sun (1000 W/m2) and under concentration using an Agilent current-voltage (I-V) tracer. A Kipp & Zonnen CM3 pyronometer was used to measure global irradiance, while the Kipp & Zonnen CH1 pyroheliometer was used to measure direct irradiance. Temperature was recorded by making use of a single K-type thermocouple attached to the back of the PV receiver. In order to facilitate an appropriate design for the prototype LCPV module, the model developed for the preset conditions was applied to further investigate the appropriate number of facets and PV receiver width. These parameters were determined as a function of concentration, while keeping module aperture constant as shown in Figures 3 and 4. 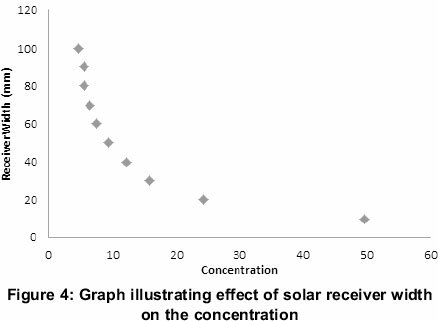 Figure 3 illustrates the relationship between the concentration factor and number of reflector. 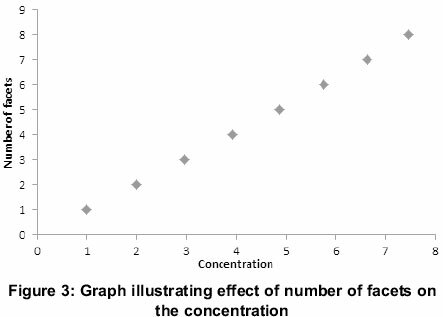 The data illustrates a linear increase in concentration factor as more facets are added. This is what is expected, due to the linear increase in irradiance incident on the receiver with increased number of facets. Figure 4 illustrates the relationship between the concentration factor and the receiver width at a constant total reflector width. The modelled data illustrates that the receiver width will decrease with an increase in concentration factor, if the total reflector width is kept constant. This indicates that an ideal concentration should have a small as practically possible receiver width. 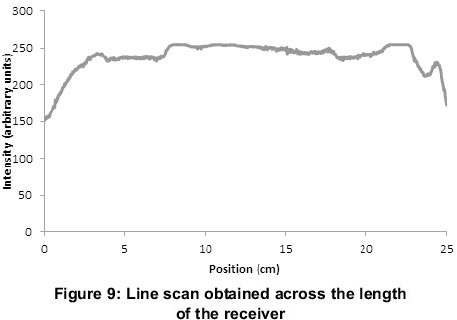 However, for the purposes of this study, a concentration ratio of the order of 5 X was the aim, thus from the data a receiver width of 60 mm to 80 mm should be used. Before construction of the concentrator prototype could commence 3 types of reflective material were tested. The three materials were reflective Aluminium cladding material, Alanod Standard Miro and Alanod Miro Sun. The material with the highest reflectivity in the 400 nm to 1200 nm wavelength range which corresponds to the spectral response of silicon, was selected as reflector material. The spectral loss from the reflective material was determined by measuring the incident and reflected solar spectrum for the different materials using a spectrometer with a solid state detector. 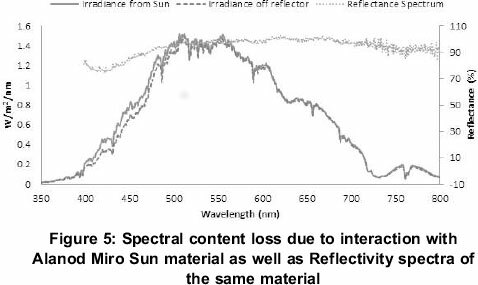 Figure 5 illustrates the optical losses of solar radiation reflected off of the Alanod Miro Sun material and the corresponding reflectivity. Table 1 lists the total loss due to varying reflectivity of the different materials in the 400 nm to 1200 nm wavelength range. The losses were calculated by taking the difference between the spectral irradiance from the sun and the spectral irradiance of the sun's irradiance after it was reflected of the reflective material. 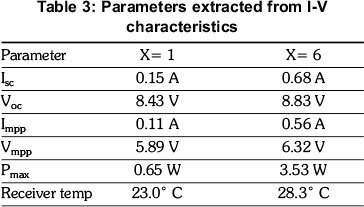 From Table 1 it is clear that the Alanod Miro Sun material is more suitable for application in CPV modules because of the lower spectral loss in the spectral range of the Si solar cells to be used. This can also be observed from the high reflectivity of Miro Sun material across the wavelength range of interest. Based on the above findings, a prototype LCPV module was constructed and characterised with respect to concentration level, illumination uniformity and electrical performance. The module is shown in Figure 6. 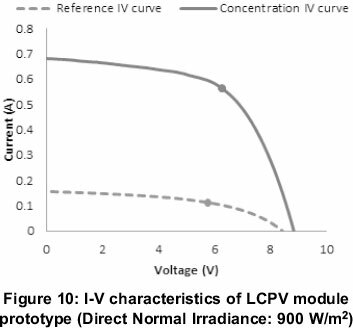 Table 2 illustrates important parameters of the prototype LCPV module. It should be noted that only half the module was used in this evaluation and ideally there should be 2 sets of reflectors and 2 receivers. No cooling system was included in the prototype module and it fully relies on natural convection. In addition, it should also be noted that reflection losses and cosine correction were applied to obtain the reduced modelled concentration. The first step was to characterise the illumination intensity distribution across the receiver area. This was done by digitizing a photograph of the receiver plane under illumination and analysing it using a software package called Image J. The software analyses the brightness of each pixel and creates a surface plot of brightness vs. position in the receiver plane. The photograph and digitized image are shown in Figure 7. The illumination intensity distribution obtained from the concentration is non-uniform as can be seen in Figure 7 (a) and (b) and is expected to have an impact on the electrical performance of the concentrator. The lines drawn on Figure 7 (a) illustrate the arbitrary lines where line scans were obtained. The non-uniformity in the illumination distribution is most probably caused by misalignment of one or more of the facets. 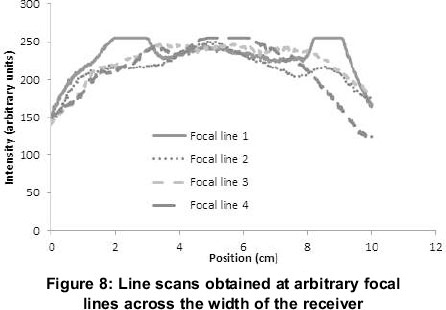 The illumination profile uniformity is further illustrated in Figure 8, showing typical line scans along the receiver width (parallel to fingers) and along the length of the receiver (across the fingers and crossing all the cells) which is seen in Figure 9. It should be noted that the performance of the LCPV module will be dependent on the uniformity of the illumination and that non-uniformities in the illumination profile may result in mismatch between the cells of the receiver. Mismatch usually occurs when a drastic variation is found in the intensity profile along the length for a series connected cell string. When a receiver consists of 2 strings connected in parallel the uniformity along the width needs to be symmetrical about the two cell strings ensuring that each cell string receives the same amount of irradiance. These non-uniformities could result in a variation in the contribution of each cell. Illumination uniformity along the length of the receiver or string is also important as this can lead to mismatch of neighbouring cells which can decrease the current generated by a string. The final characterisation was the evaluation of concentration level and electrical parameters. Effective concentration level is determined from the increase in short circuit current. The PV receiver used in this evaluation consisted of 16 multicrys-talline Si cells in two parallel strings, each parallel string consisting of 8 series connected cells. Figure 10 shows the current-voltage characteristic of the module at 1 sun and under concentration, with the respective electrical parameters listed in Table 3. Figure 10 illustrates an increase in Isc from 0.15 A to 0.68 A (X = 4.53). The maximum power increased by 5.4 X, from 0.65 W to 3.53 W. The increase in Pmax is greater than the increase of Isc, this is due to the logarithmic increase of V with the increase in solar flux. Theoretically a modelled concentration ratio of X = 6.02 was expected for this design where only X = 4.53 was obtained experimentally. The two main reasons for not reaching the desired theoretical ratio are; misalignment of optical elements in the system that results in illumination non-uniformity and optical losses. The distance between the reflector and the receiver as well as the large oblique angles leads to an increase in required accuracy when constructing the design. Small misalignments of the reflector elements lead to large misalignments of the solar radiation. In this study the optical design of a LCPV module was discussed, a mathematical model was created, various reflective materials tested and a prototype LCPV module constructed and tested. The results illustrate the importance of the role that the optical configuration and alignment plays in the performance of a LCPV module. Optical losses and misalignment of optical elements lead to a reduction in concentration levels and thus performance. The fact that the prototype did not reach the expected concentration levels can be largely attributed to inaccuracies in the construction and optical losses of the faceted reflector. This then results in non-uniformity in the intensity profile and a less than expected irradiance. The design of the LCPV module therefore needs to make allowance for manufacturing tolerance levels that can practically be achieved. In spite of the issues that were highlighted in this paper, the results show that LCPV has the potential to lower the cost of producing electric power from photo-voltaics.